Glide Week : Riding the S-Wave! Total Score: 7.7 - BEST VALUE AWARD! Introduction: Every couple of years it seems a new bait or type of bait rises to prominence in bass fishing circles. Usually it's not something new, but something that's been around for quite some time and is suddenly "discovered" or simply has its secrets revealed in regional or national tournament competition. Here in Northern California, that next wave has hit and just when we thought it had already passed by, we find there's a whole 'nother group of anglers paddling out to catch the even bigger, follow-on wave. It's Glide Week on TackleTour.com. First up? River2Sea's SWaver. 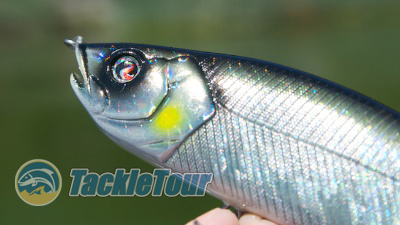 Are you familiar with two piece glide baits? 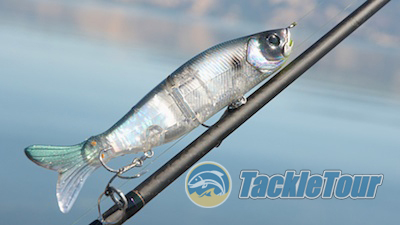 We've reviewed several here on TackleTour one of the most recent being the very popular RomanMade Negotiator. The popularity of this bait is pretty significant. What you may or may not realize is, there are several other, somewhat similar baits out on the market - and more hitting store shelves every other month! We're going float in the swells and play a little catch up this week. First up in the appropriately named, River2Sea S-Waver. 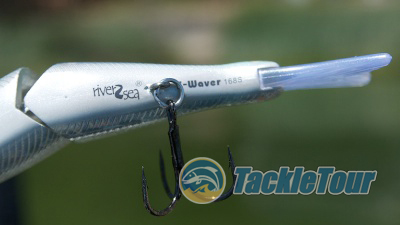 Quality/Construction: River2Sea's S-Waver has been on the glide bait scene for quite some time. It has been the bait of choice for tournament anglers in the know because it is very attractively priced. 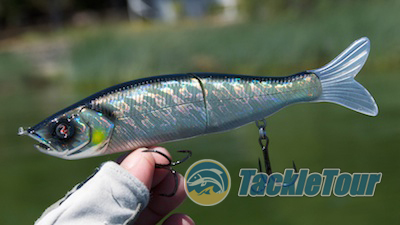 This two-piece bait is plastic, with a good bit of detailing both in its head and along its body depending on the color you choose. Really out of the package, the S-Waver is as impressive a bait we've seen from this manufacturer. The only questionable thing I see on this bait from a quality perspective is the hardware, but hooks and split rings are easily replaced. Here's a quick look at the SWaver in action. Performance: Up until recently, the River2Sea S-Waver was only available in two sizes. One right around four inches and the other right around six inches. The manufacturer has just released an eight inch version. Our tests are limited to the six inch model only. Given this bait weighs right around one and a half ounces, you do not need any special equipment to fish it. The SWaver is available in three sizes. Pictured is the popular 168. I've been fishing the S-Waver 168 on standard Heavy powered rods with anywhere from fourteen to twenty pound nylon monofilament. With glide baits in general, I find the medium retrieve ratio reels work best for me or anything around a 6 to 7:1 but this will vary with the bait. The S-Waver works best with something right around a 6.4:1 retrieve. This coupled with the stretchiness of mono and a retrieve full of half turns seems to give it the best chance to swim in that lazy-s pattern you want. Detailing on this bait is very good. On the fall, the S-Waver has a very neutral attitude. This is a good thing as it falls ever so slowly in the water column (about one foot for every one to two seconds). To get it going, you need to either start your retrieve really quickly or give your rod tip a jerk. Once you do that, bring the bait back with a series of half turns of your reel handle and the bait will swim side to side. If you employ a steady retrieve this will either tighten the gliding motion up, or eliminate it all together. Movement at the joint is very slight.